Wong Side of the Tracks is a side mission in Grand Theft Auto: Liberty City Stories. It can be accessed at Baillie Station of the Portland El in Saint Mark's, Portland. In this mission Toni Cipriani drives along the train tracks on a Sanchez whilst being chased by The Wong Brothers in an attempt to pass through all the checkpoints. The mission is timed and the player is given fifteen seconds to reach the first checkpoint and fifteen seconds of extra time for each subsequent checkpoint passed. The player will receive $1,500 after the completion of this mission. After completing the mission, Chinese food appears on a table in the Portland safehouse. 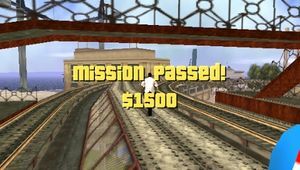 This mission may have been inspired by the mission "Wrong Side of the Tracks" from Grand Theft Auto: San Andreas, due to the similarity in name. Also, both missions involve a Sanchez and a train. This page was last modified on 8 April 2012, at 20:34.